What the crews have to say about the unique challenges of racing on Hamburg’s River Elbe, in the heart of one of the busiest sea ports in the world. Comanche, a 100 ft. maxi yacht owned by billionaire Jim Clark, is celebrated as a vessel at the very cutting edge of sailing, and made a big splash at the Transatlantic Race 2015. WSJ.com's Aaron Kuriloff reports in this video published July 2015. With over 1,500 entries and 16,000 sailors the annual Round the Island Race is a spectacle. But this year’s race was particularly special for one team that smashed race record – The World Sailing Show has the story and footage of the record breaking run. As the Games gets within striking distance, a new type of pressure is building for the competitors. We talk to the man they call the medal maker along with the British Olympic Sailing Team manager about the mental pressure of the Games. Sailing with a sibling might not seem to be the perfect match, but two Chilean brother and sister pairings will be heading to the Games for a family affair in Rio. And Andy Rice explains why this Olympic class is so popular, yet so hard to sail well. Plus, news from around the world. Winners of the 108th Chicago Yacht Club Race to Mackinac Island have crossed the finish line. The Flying Buffalo, sailed by Al and Bob Declercq, won the Mackinac Trophy Division, completing the 333 mile race in 46 hours and 52 minutes. The Flying Buffalo is now a four-time winner of the race. The Natalie J won the Mackinac Cup Division and Turbo Section, finishing in 26 hours and 15 minutes. Storms made for a tough race this year, with 22 boats dropping out and one even sinking. More here. Published on Jul 29, 2016: Quantum Racing went into the final day with a 9pt lead over trailing Azzurra and Bronenosec. Find out what happened! Next stop: Mahón for the TP52 World Championships. Stay tuned. Racing starts again on 14th September. July 30, 2016: interviews with RORC Racing Manager, Nick Elliott and leading skippers - France Blue, Flanders North Sea, France White. Video above from Day 1 of the Brewin Dolphin Commdores' Cup. Published July 24, 2016. 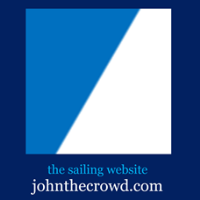 Brewin Dolphin Commodores' Cup Homepage: Brewin Dolphin Commodores' Cup 2016 - The Brewin Dolphin Commodores' Cup is the Royal Ocean Racing Club's (RORC) biennial flagship event for national teams with amateur crews. The international offshore regatta comprises a tough mix of inshore and offshore racing and is an intense seven-day programme that pits three-boat teams against one another to accrue overall team points. For the next edition, The RORC Committee have agreed to a number of changes that will have a positive impact on the number of teams taking part in the event held at Cowes, Isle of Wight between 23 and 30 July 2016. Live Land Rover BAR Morning Show and afternoon Analysis Show from the ACWS Portsmouth base with presenter Helen Bulkeley and members of the Land Rover BAR sailing team to talk all things @AmericasCup World Series at Portsmouth @ACWSPortsmouth. 8 tonnes of carbon fibre yacht, a 255 horsepower jet ski, 45 combined years of sailing experience, and one crazy guy in a suit. Alex Thomson attempts what he calls 'The Keel Walk', a stunt that has become infamous throughout the world thanks to the iconic image of Alex 'riding' the keel of his 60ft yacht 'HUGO BOSS'. Uploaded Jan 27, 2012. Solo round the world yachtsman Alex Thomson performs a daring feat on board his high-speed yacht, HUGO BOSS: He climbs up the 30-meter high mast of the moving vessel and dives into the ocean. Published March 3, 2014. Episode III of the Road to Vendee--watch Alex Thomson and team stretch the legs of HUGO BOSS for the first time after her refit following Transat Jacques Vabre in October. Published May 4, 2016. Just a few months remain until the start of the IMOCA Ocean Masters Vendée Globe on 6 Nov 2016. Setting sail from the ‘Big Apple’, bound for what was the cradle of the IMOCA Class, the port of Les Sables d’Olonne, France, one could hardly ask for more in terms of symbolism. On the one hand, New York, a cosmopolitan crossroads of influences, is a perfect illustration of the international aspirations of both IMOCA and Open Sports Management. On the other, France’s Vendée region, represents the heart of the IMOCA class, thanks to its legendary solo round the world race, in which some of the most extraordinary episodes on the high seas have occurred over the last twenty-five years. The final opportunity to qualify for the Vendée Globe in race configuration, the New York – Vendée (Les Sables d’Olonne) promises to be a significant event in the IMOCA Ocean Masters Championship. Above all, the New York – Vendée (Les Sables d’Olonne) will be the final major confrontation in singlehanded configuration before the Vendée Globe. Ocean Masters is the new global brand of the Imoca class and represents the world championship circuit which is awarded every two years. Ocean Masters has a vision : to internationalize the IMOCA class, to grow its profile and value, to introduce new events, new venues, new skippers and teams, new sponsors to the class and the grow the global fanbase supporting this incredible sport. The Imoca Ocean Masters Championship includes two round the world races, the Vendée Globe which is singlehanded and the Barcelona World Race which is doublehanded, the Route du Rhum, the New-York to Barcelona race, the Transat Jacques Vabre, The Rolex Fastnet Race and several other ocean races. Founded in 1991 and recognised by ISAF since 1998, IMOCA is the class association, which takes care of 60-foot Open monohulls Imoca 60 (18.28 metres). With more than thirty skippers signed up, the fleet sails the Vendée Globe and the Barcelona World Race. The Offshore Yachting Club of Rhodes is organizing for the 20th year the international sailing race RODOS CUP 2016 in the beautiful Dodecanese islands. Setting sail from the island of Hippocrates Kos, we will visit the islands of Nisiros, Tilos, Symi and the sun island of Rhodes. Rodos Cup 2016 will take place from July 17th 2016 to July 22nd 2016. Rodos Cup 2016 is co-organized with the South Aegean Islands Region and is supported by the Municipalities of Rhodes, Kos, Symi, Tilos and Nisyros. Video published May 31, 2016. We start and finish the day with a sustainability theme: an ambassadors' meeting and a beach cleanup with 11th Hour Racing​. In between we held two WL Races, with a light breeze and a twist in the tale of the leaderboard as Quantum Racing​ were forced to restart in Race 7. Two points adrift are Rán Racing​ with it all to play for in the final day here in Porto Cervo. Published July 2, 2016. Race 12 in the Clipper 2015-16 Round the World Yacht Race, The LegenDerry Finale, was the last tough ocean crossing from New York to Derry-Londonderry: 'The Journey Home' captures the battle between Derry~Londonderry~Doire and LMAX Exchange. The Northern Irish team are looking for a win into their home port - they give it everything. This short video filmed and edited by on-board TV documentary maker Rich Edwards of 1080 Media TV. The full story will unfold in final episode of 'The Race of Their Lives 2' the global television series, this autumn. Published July 11, 2016. Emirates Team New Zealand skipper Glenn Ashby has helped Swiss Team Tilt to won the second stage of the GC32 Racing Tour in Malcesine on Lake Garda in Italy by just one point over closest rival Norauto (Franck Cammas). Published July 10, 2016. It's no secret Kate Middleton and Prince William have a love for sailing, so they must be thrilled at the adventure coming up for them later this month. The Yacht Club of Rio de Janeiro plays host to the 29th annual two week regatta, where teams are testing their Olympic equipment and readiness. The eastern Solent threw up a magnificent opening day of competition for the RC44 Portsmouth Cup with the wind mostly blowing at 10 knots before building to 20+ ahead of a squall. Once this kicked in it provided the high speed thrills and spills for which the nimble one design RC44 keelboat is famous in these conditions. The stand-out performance of the day was from Vladimir Liubomirov's Bronenosec which was unbeaten across the five races she sailed today. Igor Lah's Team CEEREF, the present RC44 fleet racing championship leader, had one of the best match racing days of her long career in the RC44 class, winning five of the seven races she sailed. The RC44 Portsmouth Cup is the third event of the 2016 Championship Tour, which pitts the world's top businessmen and the best sailors in the industry compete in high performance one-design 44-foot carbon racing yachts. Published July 13, 2016. Published on May 16, 2016: The RC44 World Championship Marina de Sotogrande, Fleet racing day 4, had a worthy winner in Igor Lah and his Team CEEREF crew, the second occasion the Slovenian team has claimed this prize. But this was only after some anxious moments off the Andalusian port, as Lah's crew slogged it out with local heroes, John Bassadone's Peninsula Petroleum from nearby Gibraltar. RC44 Portsmouth Cup 13-17 July 2016: "... a home-water advantage for five-time RC44 Championship Tour winner Team Aqua. Owner Chris Bake, will be hoping to lead his team to a home victory this summer. The world famous and challenging waters of the Solent host some of the world’s most famous sailing events including, Cowes Week and the Round the Island Race. These waters will be a fantastic event for the class offering dynamic sailing at the UK event. "It’s great to have such a prestigious and high caliber event come to Portsmouth. We are delighted to be able to host the event from within our Team headquarters. Allowing us to share these outstanding facilities with like-minded individuals and we will enjoy having ringside seats to the action this RC44 event is sure to bring. It’s a pleasure to have you all here and good luck,"--Sir Ben Ainslie." 1000 - 1100 Skippers briefing. Guest briefing & tour of Land Rover BAR base. Phil Robertson has been crowned World Match Racing Champion after beating Taylor Canfield in an epic, high-wind duel today in the Final of the World Match Racing Tour. The 29-year-old and his Robertson Racing crew also banked US $33,000 for winning in Marstrand, Sweden, plus a World Champion’s bonus of $1,000,000. It’s the largest prize money ever awarded in the sport of sailing, but Robertson’s whoops of joy and celebration were more about winning the title of Match Racing World Champion. “It’s a dream come true and the goal we’ve been striving for since 2009,” he told the crowd that he just done his best to drench with champagne. “ To do it here in Marstrand, I couldn’t think of a better place. Thank you all for watching, I hope it was entertaining because we sure had fun.” More info: wmrt.com - Top 20 teams from the season leader board battled all out in this final leg with an eye for the biggest prize money in sailing history of USD1million and the championship trophy. Enjoy the most beautiful images of the fleet's recent visit to the Costa Smeralda. Congratulations again to Quantum Racing​ for winning the regatta. Next stop: Puerto Portals​ for the Puerto Portals Sailing Week. Stay tuned. Racing starts again on 25th July (video published July 6, 2016). Russell Coutts' Olympic gold medal launched an international career that sees him recognised as the most successful America's Cup skipper. A look back at all the action from Louis Vuitton America's Cup World Series Chicago, two capsizes, incredible racing and huge crowds made the first America's Cup racing on freshwater a huge success. Artemis Racing previously struggled with inconsistency but came into their stride in Chicago, winning the event after a strong performance on Super Sunday. Video published June 22, 2016. The team won the gold medal in the Sonar class at the 2016 Para World Sailing Championship in the waters off Medemblik, Netherlands, in May. Act 3 of the Extreme Sailing Series tour was in Wales from 23-26 June. The 2016 Extreme Sailing Series™ has introduced a new breed of GC32s making their UK debut. With 29 races held during Act 3, seven international teams went head-to-head in front of the crowds that lined Cardiff Bay in their thousands. A day-by-day guide to what happened in Cardiff Bay during Act 3, the UK leg of the 2016 global Extreme Sailing Series Stadium Racing tour. 2016 Worlds | farr40worlds.com: "Plenty (Alex Roepers, USA) won the Rolex Farr 40 world championship on Sydney’s Manly offshore course today with clever, conservative sailing for a third and a second in the last two races while his two closest opponents fell out of contention with early errors..."
The fifth and final day of the 2016 Audi Settimana delle Bocche saw Rán Racing challenge Quantum Racing for the title. Next stop: Puerto Portals for the Puerto Portals Sailing Week. Racing starts again on 25th July. US Navy report: Failure at every level for US ships captured by Iran | CNN.com: "... The report found the crews were poorly prepared, their boats not properly maintained, communication almost entirely lacking, and their conduct after being captured by the Iranians wasn't up to military standards. In a stunning finding, the report said the sailors veered off course almost immediately after heading out to sea and had no idea where they were when a mechanical failure struck one of the boats. "The boat crews could visually see Farsi Island, but were not concerned as they were unaware that it was Iranian or that they were in Iranian waters," the report said..."